This is a limited 2-day only sale that will expire at midnight on Tuesday, April 5, 2011. Click here to buy now or for more information about the deal. Quantities are limited so don’t miss out! Limit 1 per person, may buy 1 additional as a gift. Limit 1 per visit. By appointment only. Today’s Groupon: for $30, you get a mani-pedi (a $60 value) at Berns & Black Salon & Spa on Main Street. Berns & Black, an exchange-district salon whose stylists exude quirky elegance, uses all-natural products in its spa services. During the mani-pedi, finger and toe berets get a thorough wash and softening, followed by a paint job in either an adventurous or a high-toned new colour and polish. The experience culminates with a relaxation massage. Newly painted hands may take home a mini version of the polish of their choice, all of which are vegan, paraben-free, and sulphate-free. For a limited time, Old Navy has a Spring Sale where you can save up to 40% off select styles on women, men, girls, boys, newborns and baby girls & boys apparel. This sale is available in-store and online. 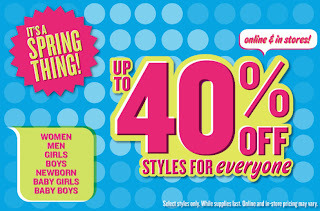 Click here to shop Old Navy on-line now or for more information about this sale. 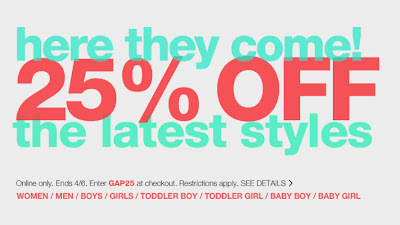 Gap currently has an online only sale where you can save 25% off the latest styles! The sale is available now until Wednesday, April 6, 2011. To get the discount, simply enter the promo code “GAP25” at checkout. Gap offers free shipping on any order over $50. Offer valid from April 4, 2011 12:00 a.m. ET through April 6, 2011 at 11:59 p.m. ET. Offer valid in Canada only on regularly priced Gap merchandise purchased online only. Not valid at Gap, Gap Factory or Gap Generation stores. Not valid on sale items. Discount applies to merchandise only, not value of GiftCards, packaging, applicable taxes, or shipping & handling charges. Click here to shop Gap online now or for more information about this sale. For a limited time, all 2011 Entertainment Discount Books are only $15 each with free shipping! I buy a book every year and have saved a ton of money over the years. You’ll easily break even and more after using a couple coupons. This is the lowest price that I’ve seen these books sell for. They had a 50% off discount with free shipping offer about a month ago, but this deal is cheaper and better! Depending on the city, some books retail for up to $45 (Save 67% off)! Plus, with each book purchase you get online access to hundreds of additional local printable coupons and incredible online shopping discounts not found in the book. The amount of valuable discount coupons available will amaze you! Click here to shop Entertainment Discount Book website now or for more information about the deal. This is a limited 1-day only sale that will expire tonight at midnight (Sunday, April 3, 2011). Click here to buy now or for more information about the deal. Quantities are limited so don’t miss out! Includes a ten session pass to BOOM BodyShaping. Limit 2 per person – stackable. With an array of programs and personal trainers to assist you in reaching those fitness dreams, BOOM BodyShaping Studio is the ultimate workout experience. Their unique system sets them apart from their competitors and leaves you with some seriously successful workout results. Today’s Buy gets you a 10 Session Pass to BOOM where you’ll reap the benefits of semi-private training sessions from their fantastic team of Fitness Specialists! In a semi-private BOOM BodyShaping class you’ll work out in a small group (max. 4 clients) with people who have similar work out goals. Accountability and motivation from other people going through the same fitness experience makes achieving those results so much easier! If new to exercise, private sessions might be more your style – just you and a trainer working together to get you fit, toned and feeling fabulous. And with the chance to buy 2 tickets per person, increase those ten sessions to twenty, giving you even more opportunities to experience BOOM’s one of a kind workout studio. Expect increased energy, strength, an all over toned body, a ramped up metabolism, decreased stress and anxiety and other awesome health benefits from each of the programs available at BOOM BodyShaping Studio. 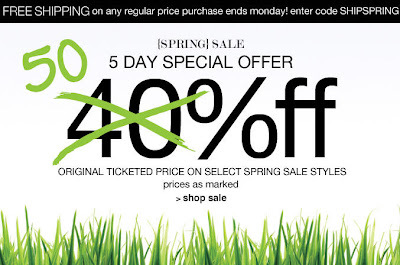 Ricki’s currently has Spring Sale where you can enjoy 50% Off the original ticketed price on select spring styles. This sale is available in-store and online until Monday, April 4, 2011. If you’re shopping online, you can get free shipping if you add any regular priced item to your order by entering the promo code “SHIPSPRING” at checkout. Click here to check out the sale at Ricki’s website.